Going out to eat can be stressful and overwhelming for gluten-free newbies unsure of which local restaurants are knowledgeable and accommodating of gluten-free eaters. “When I first transitioned to the gluten-free diet, I didn’t go out to eat because I was nervous. It was overwhelming,” remarked Yelp Elite member Bethany Mazur. “Once I became knowledgeable, I started going to places that I was a regular at…places that I knew I could trust the chef,” Mazur added. Thanks to the increased awareness and popularity of the gluten-free diet, dining out with Celiac has become much easier in recent years. Similarly, thanks to resources like Yelp and Urbanspoon, finding gluten-free friendly eateries is a quick and seamless process. Even better is that such resources contain personal ratings and reviews which, for the gluten-free community, are extremely valuable considering the bond that exists among those with Celiac. Scarcity: despite the fact that gluten-free products are taking up more shelf space by the day, there is a scarcity of quality products in the market, resulting in excitement when finding good gluten-free alternatives. Low awareness: the lack of knowledge about Celiac results in a large number of sufferers taking on the role of ambassadors to spread awareness. Expense: the high cost of gluten-free products means that it’s not easy to sample new brands or restaurants without breaking the bank. For example, I recently found my new favorite brand of gluten-free bread, Canyon Bakehouse, and while definitely worth it for its quality, it cost $7.19 for one loaf! That’s not exactly easy to squeeze into the budget for a young professional who has to juggle rent, bills and student loans on top of the everyday essentials such as toilet paper, detergent and chocolate. The difficulty in finding and budgeting for gluten-free alternatives, the scarcity of high quality products in the market and the lack of awareness of the disease all result in the immense value of personal recommendations in the Celiac community. Similarly, the level of knowledge that a restaurant has about Celiac disease is a big factor in shaping the comfort that gluten-free eaters have when going out to eat. “I’m always skeptical of a restaurant when I receive puzzled looks after asking if a menu item has wheat or flour… I’m more comfortable eating at places that I know are knowledgeable of the gluten-free diet,” said Mazur. Despite having different tastes and preferences, there is no doubt that you’d be more willing to splurge on a $7 loaf of bread, or visit a new restaurant, that was recommended by a friend rather than a commercial or a blog post written by a stranger. Since my diagnosis a few years ago, I have made it my mission to scope out the most gluten-free friendly eateries in the Queen City. I’ve decided to highlight my favorite spots to frequent for some quality gluten-free alternatives to help my fellow Buffalonians more easily adopt the gluten-free lifestyle without wasting precious time and money on sub-par products and places. This quaint little Williamsville eatery has been making waves since opening 18 months ago. 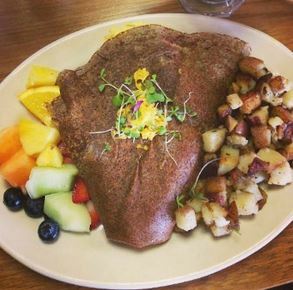 As one of the only establishments serving up crepes (both regular and buckwheat), Break’n Eggs has carved out its niche. 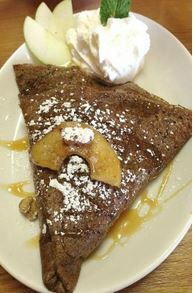 During my last visit (for brunch) to Break’n Eggs, I ended up devouring not one, but two buckwheat crepes. I started with the Breakfast Crepe, ($11.50) which includes two eggs, cheese and meat. I opted for my eggs scrambled, my cheese cheddared, and sausage. I also decided to add spinach and caramelized onions to the crepe, resulting in a crepe the size of my face. I opted for the Dulce De Leche Crepe ($7.75) which, according to the waitress, is the best sweet crepe on the menu. It consisted of cinnamon coated apples, candied walnuts, caramel sauce and resulted in pure happiness. Both crepes were served warm and were melt-in-your-mouth delicious. While they don’t take reservations (possibly due to their small space), Break’n Eggs is a brunch must that is definitely worth the twenty minutes you might spend waiting for a table. The servers are very friendly, and the wide selection of crepe options makes for an overwhelmingly enjoyable dining experience, which is guaranteed to satisfy your sweet (or savory) tooth. With 10 locations around the city, Just Pizza is a great choice if you’re looking for a gluten-free pizza to grab on the go. Like most other restaurants offering a gluten-free pizza option, Just Pizza uses a frozen crust. However, unlike most other restaurants, Just Pizza does a great job at making its gluten-free pizzas stand out with an expansive list of toppings. Similarly, the gluten-free pizza crust (which comes from US Foods) is surprisingly doughy and hearty when considering the fact that it comes frozen and is quite thin. While the list of specialty pizzas can be slightly overwhelming (including over 30 different varieties,) I’ve found that you can’t go wrong with any of Just Pizza’s specialty white pizzas. Due to the thinness of the gluten-free crust, I have found that white pizzas are a better choice when ordering gluten-free rather than red-sauced pizzas. I’m a big fan of Just Pizza’s Bruschetta, Spinach Pesto, and Roasted Garlic pizzas but my all time favorite is the Basilico White ($14), which has a herb crust and includes fresh sweet basil, chopped tomatoes, fresh mozzarella and caramelized onions. I’ve got to commend Brick Oven Bistro for its “Gluten-Free Good Neighbor” status. This hidden gem offers a trio of gluten-free delicacies: sandwiches, pizza and pasta, which is hard to come by. What’s the catch, you might ask? The tremendous trio isn’t all served at the same time. The gluten-free sandwiches are only offered during lunch hours and are made using bread from a local gluten-free bakery, Bon Bon’s. The gluten-free pasta offered (usually RP’s fettuccine) is only available during dinner hours. 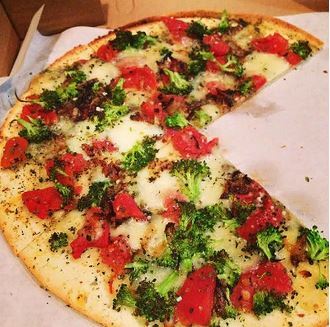 Just like Just Pizza, Brick Oven Bistro gets its gluten-free pizza dough from US Foods. Brick Oven Bistro’s gluten-free pizza is the one g-f option that is available all day long, and with good reason. According to the staff, the pizzas are the most popular gluten-free option on the menu. My favorite pizza on the menu is the gluten-free Vegetarian Pizza ($14), which comes with herb ricotta, tomato relish, arugula & mozzarella. The herb ricotta and tomato relish work perfectly together and seem to take the place of a red sauce, keeping the crust sturdy. The result is a flavorful but not overly filling pizza which is the perfect size for one ‘hangry’ individual. With locations on Main Street, Hertel and Elmwood, Globe Market is one of the more popular and well-known places to go for a quality soup, sandwich, salad or any combination of the three. Considering my favorite lunch food is a sandwich, it’s understandable that Globe would be my No.1 lunch spot in Buffalo since it not only offers gluten-free sandwiches, but soups and salads too. Globe’s staff is knowledgeable of the gluten-free diet, so employees will be quick to chime in on whether the soup or salad you desire is gluten-free. Globe makes its gluten-free sandwiches using Udi’s bread, which is one of my favorite brands. Despite the wide selection of specialty sandwiches, I almost always end up ordering the Chipotle Turkey or Spicy Italian. 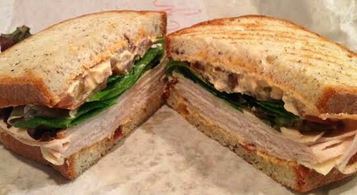 The Chipotle Turkey sandwich ($8.25) comes with roasted turkey, provolone, tomato, mesclun greens and the best condiment to ever pass my lips, chipotle bacon mayo. 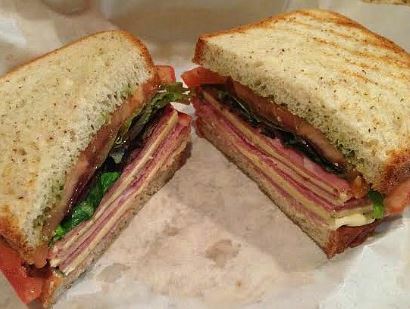 The Spicy Italian sandwich ($8.25) consists of cappicola, salami, pepper jack cheese, tomato, lettuce, pesto and mayo, making it the perfect choice for meat lovers. As you can see from my previous restaurant profile, I’m a big fan of Merge. Merge has one of the most gluten-free, vegan and vegetarian friendly menus in the city from start to finish. While I could rave about the restaurant’s dessert options for days, the single best item (and the most popular gluten-free item) on its menu is the Caprese Pizza. The Caprese Pizza ($10) comes with tomatoes, red onion, basil, pesto and fresh mozzarella with a balsamic reduction drizzled on top. While the combination of flavors is delicious, the best part of the dish is the pizza crust itself. Merge is the only restaurant I know of that makes their own gluten-free pizza dough fresh in-house resulting in a crust that is both moist and doughy. Last but not least, my favorite meal, brunch. When I think of brunch, I immediately think of Betty’s. 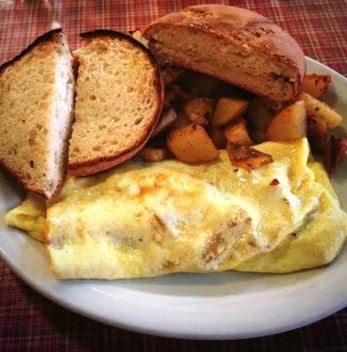 I became a regular at Betty’s shortly after my first visit years ago when I developed an infatuation with its specialty omelets and gluten-free buns. Betty’s has been my go-to brunch spot ever since. In addition to catering to gluten-free diners by serving up the best buns in the city, Betty’s caters to the vegan and vegetarian diners as well. All of Betty’s menus (breakfast, lunch, dinner, Saturday Blunch and Sunday brunch) boast an abundance of options for varying palates and diets. I was surprised to learn that Betty’s dinner menu is the most gluten-free friendly, with six of the seven entrees listed as gluten-free. Betty’s uses Brian’s Best buns for its gluten-free bun offering. 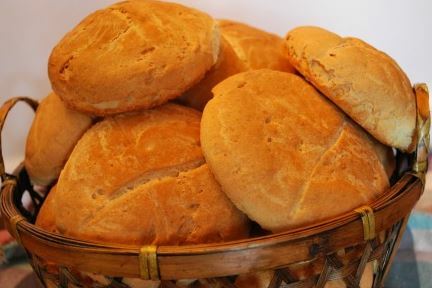 Brian’s Best Buns are the closest thing to gluten-based bread I have found in Buffalo. 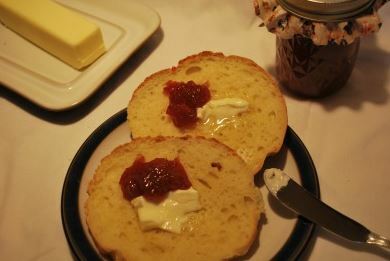 The rolls are moist, airy and fluffy, three characteristics which are hard to find in gluten-free bread. Brian’s currently doesn’t sell to individual or retail stores, meaning that in order to get your gluten-free best-bun fix, you’ve got to visit Betty’s. There is no doubt that Buffalo is becoming increasingly knowledgeable and accommodating of the gluten-free diet. The restaurants above are my personal favorites but there are a number of resources available to visit for further assistance on navigating Buffalo’s restaurants as a gluten-free eater. I find Yelp and Urbanspoon to be the two best resources, as they focus more on local restaurants than chains. Two other resources worth checking are the WNYGFDSG and Find Me Gluten Free. Regardless of what resource you use, I can guarantee that you’ll be pleasantly surprised at the level of awareness and accommodation of the gluten-free diet among local eateries. Please comment below sharing your favorite restaurant which you think has earned its place as a Gluten-Free Good Neighbor. The knowledge and awareness of Celiac has come a long way over the past five years. When I was diagnosed with Celiac in 2009, the availability of gluten-free products had already made tremendous strides compared to when my sister was diagnosed with the disease five years prior. Having both a sister and a mother with Celiac made it easier for me to adopt a gluten-free diet. In cities like Buffalo, known for being slow to adopt the latest trends, finding good gluten-free food that is easily available can be challenging. Because of scarcity, I have grown to appreciate any Buffalo restaurant that is knowledgeable and accommodating of the gluten-free diet. One of Buffalo’s forward-thinking restaurants, Merge, 439 Delaware Ave., Buffalo, has done an incredible job at providing gluten-free dieters with an expansive list of menu offerings. Merge was founded in January 2009 by sisters Sarah and Eliza Schneider, who shared a lifelong dream of opening a restaurant together featuring vegetarian and other progressive food options. “Offering gluten-free, vegan and vegetarian options seemed to fit in well with all of the other elements we were introducing to the Buffalo food scene,” said Sarah Schneider. For gluten-free, vegan and vegetarian diners, browsing Merge’s menu makes you feel like a kid in a candy store. Of the 35 items on the menu (including soups, salads, appetizers, raw dishes, sides and entrees), only seven dishes contain gluten. “We try to be creative in offering gluten-free, vegetarian and vegan options that you couldn’t make at home or find anywhere else,” said Sarah. Merge’s extensive and creative list of menu offerings certainly separates it from other restaurants in Buffalo. The Schneider sisters have not only succeeded in creating an eclectic menu, but they have transformed Merge into more than just a restaurant. It’s a place you want to spend time at. “Merge is a hip, New York sort of environment,” Sarah remarked, and she isn’t the only one who thinks so. Local blogger Krystal Sondel echoes the sentiment and even felt inspired to write about it on her “Lovin’ On Buffalo” blog. Dining at Merge is an experience which goes beyond the positive atmosphere and the quality of the food. The wait staff is extremely friendly and very knowledgeable of how specific menu items can be altered to accommodate dietary restrictions. Similarly, the decor at Merge is colorful and bright. A quick glance around makes you feel as though you have stepped foot into an art gallery. The walls are covered with art produced by local artists which is available for sale and rotated on a monthly basis. To top it off, live music starts at 7 every night they are open—5 to 10 p.m. Tuesday through Friday and 11:30 a.m to 3:00 p.m. on Saturday—which creates a positive vibe and relaxing atmosphere. The ambiance at Merge is just one of the factors which has enabled the owners to create a loyal customer base—my latest visit on July 16 was my fourth and certainly won’t be my last. We started off with the Caprese pizza, which can be made with or without gluten. 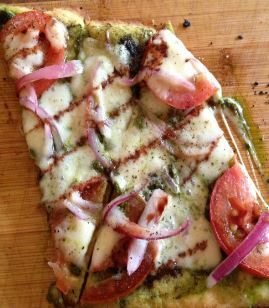 The pizza comes with tomatoes, red onion, basil, pesto and fresh mozzarella with a balsamic reduction drizzled on top. The gluten-free pizza dough is baked fresh in-house resulting in a mouth-watering, perfectly baked pizza which is big enough for one to eat as an entrée or ideal for a group to share as a snack. The crust is both doughy and moist which is rare, as gluten-free pizza is typically thin and dry. “Honestly, I prefer the gluten-free pizza over the regular one,” remarked Jimi, one of the waiters. The Caprese pizza happens to be the most popular gluten-free menu offering—and for good reason. 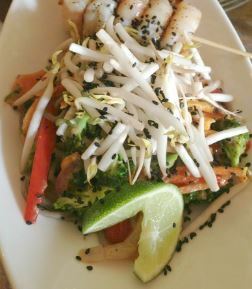 In addition to the Caprese pizza, Sarah remarked that the most popular gluten-free items on the menu are the pasta dishes and the ginger coconut stir-fry. I ordered the ginger coconut stir-fry for my entrée and I can honestly say that it was one of the most delectable entrees I have ever eaten in Buffalo. It is especially perfect if you’re looking for a light yet flavorful summer dish. The entrée includes toasted nori, broccoli, red peppers, carrots, red onion, ginger coconut sauce and organic soba noodles. The noodles were fat, soft and closely mimicked the taste and texture of udon noodles. They served as an ideal complement to the mix of fresh, crunchy vegetables. What truly made the dish was the ginger-coconut sauce. The hint of ginger helped bring out the subtly sweet coconut flavor. In addition to the Caprese pizza and the ginger coconut stir-fry, I tasted the beet salad and the maple bourbon chicken, which were both extremely tasty due to the high quality of the ingredients and the creativity behind each of the dishes. The beet salad was light, fresh and colorful. 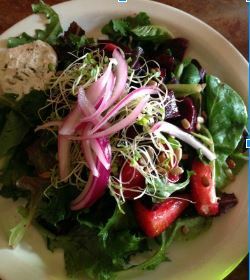 The salad comprised fresh greens, roasted beets, strawberries, pickled red onion, sunflower seeds and sprouts with a white balsamic vinaigrette. The beets were thinly sliced, fresh, sweet and roasted to create a soft yet still crunchy texture. The sunflower seeds, sprouts and goat cheese (optional), while seemingly simple, created a harmonious mix of flavors and textures. “We incorporated a half-acre hobby farm in 2012 where we grow our own herbs, peppers and other vegetables. Sustainability is one of our biggest values,” said Sarah. In addition to sustainability, the Schneider sisters feel strongly about using local, seasonal fruits and vegetables which are incorporated heavily into the menu. “We offer organic chicken and wild fish. Although we do specialize in gluten-free, vegan and vegetarian items, we feel strongly about providing options that everyone can enjoy,” Sarah remarked. Case in point: the maple bourbon chicken entrée. 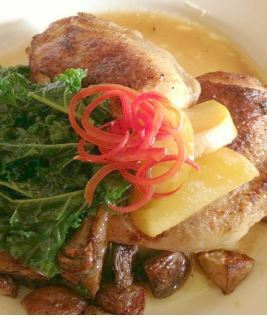 The braised organic chicken leg is served with rosemary roasted potatoes, bourbon-soaked peaches and sautéed kale. I’m not typically a fan of mixing sweet and savory, but Merge won me over with this dish. It is rich and filling. The chicken was juicy with a hint of maple, and the skin had a crisp texture to it. The potatoes were crispy on the outside and soft on the inside and absorbed more of the maple flavor than the chicken, giving them a hint of sweetness. The kale was bright and tasted like fresh, crisp spinach. The maple bourbon sauce tied the entrée together and was good enough to lick off the plate, which I almost considered doing. Although we were completely stuffed and satisfied, we had to order dessert because Merge offers a gluten-free cobbler which I’m fairly certain was made with me in mind. 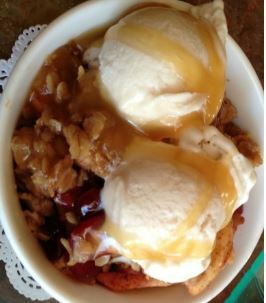 Not only is the cobbler the only gluten-free version I have yet to find, but it is the ultimate dessert if you’re looking for a relatively healthy way to satisfy your sweet-tooth. The dessert is served warm with a variety of fresh seasonal fruits and is topped with two small scoops of vanilla bean ice cream with a warm salted caramel sauce drizzled on top. It melts in your mouth with every bite. Of all the Buffalo restaurants I’ve tried, Merge offers the most eclectic and creative menu from start to finish for gluten-free, vegan and vegetarian dieters. “Merge is unlike other restaurants because of our variety and versatile menu items. We accommodate the individual’s preferences. I don’t know many other restaurants that can be so versatile and cater to different nutritional needs,” said Sarah. The dishes are innovative and the food is exceptional. The use of fresh, local ingredients and the focus on local musicians and artists clearly demonstrates that Merge is a community-centric restaurant which aims to please the patrons of our Queen City. Enter your email address to follow Gluten-Free Good Neighbor and receive notifications of new posts by email.